Happy times spent here waiting for the train back to Derby - it felt more like something from there than a London pub. Not tried the replacement Betjeman Arms, but somehow I don't think it will quite match the character of this place. Still, it beats the portakabin temporary replacement on platform 12 which I guess has (thankfully) gone. Note, that this has now been closed because of the St Pancreas station re-build for the channel-tunnel link and has been replaced with a like-named portakabin affair at the end of the new platforms. One assumes that this is temporary until the old station is re-opened (though that's a while off yet). 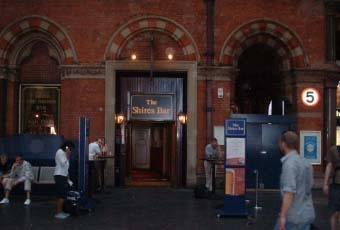 Pubs on railway stations are either transient and soulless (e.g. Coopers), or expensive, aimed at the passing posh City totty (e.g. Reef Bar). In contrast, this feels like a local pub, old fashioned, dark and dingy, and might not be to the taste of people with 21st century expectations. However, I would consider this pub not to be solely for passing trade, more than just a Quicksnacks with a license.